Our Professional End of Tenancy Cleaning in London is suitable for both tenants and landlords in London. Whether you’re selling or letting your property or would like to move in/out of a property and would like it to be cleaned professionally, we at Best Cleaning London provide one of the leading and most comprehensive cleanings in London. We have been working with estate agencies and private landlords for 16 years now and we are aware of every detail and know-how of this service. Make sure that you take a look at our complete end of tenancy cleaning checklist further below. At Best Cleaning London, our dedicated end of tenancy cleaners use vehicles that are fully equipped with all the required equipment ( including steam cleaning machines for the kitchen and the bathroom ) and professional cleaning products in order to save precious time and provide a fully satisfying outcome for both pre and post tenancy jobs. The competitive prices provided by our company, make this service suitable for both landlords and tenants, as well as estate agents in London. Over the 16 years of working along with tenants, landlords, and estate agencies, we have developed a checklist which contains all the necessary procedures for different types of properties to ensure the delivery of our end of tenancy cleaning service in the highest of standards. In addition, to ensure your ultimate satisfaction, we offer to re-do the job for free, if you are not completely pleased with the finished result. Our End Of Tenancy Cleaning in London Prices are affordable compared to different companies and or service is outstanding. Deep and detailed cleaning of toilet and toilet seat, including disinfecting, de-scaling and brushing. Clearing rubbish left in the bins and polishing of the floors of the property. Comprehensive dusting, which includes mirrors, fireplaces, radiators, curtain rails, skirting boards, light switches, light fittings, and shades. Thorough cleaning of spaces behind any kind of furniture which is frequently neglected by unprofessional cleaners. Cleaning of any furniture, including wardrobes, beds, lightings, tables, pictures frames, and curtains as well as any other type of furniture. Q: What are the guarantees that your professional end of tenancy cleaning will restore the property to the highest possible standard you claim it will be in after your service? A: The end of tenancy cleaning teams who work with us, operate according to KF Properties’ agency-approved very high standard checklists when tending to your rental property. These checklists ensure that every area in the house will be cleaned thoroughly to the highest standard before you move out. This way we at Best Cleaning London guarantee that you will get your deposit back. Q: What are your cleaners’ work hours? A: We operate 7 days a week 8 am – 6 pm. However, you should know that on Sundays there might be a small additional surcharge. The latest hour our team can start is around 4 pm. A: If you want to help, then please, before you leave your rental property, make sure to turn off your fridge and freezer at least 24 hours before our appointment. If the appliance hasn’t been defrosted before our cleaners arrive, not to worry, we are equipped with a steam cleaner and will clean the freezer anyway. A: This is extra expense that may be added to your end of lease cleaning quote. Our team always tries to find a free of charge parking space. In case there is none, then you will have to cover the cost of the parking fee for the time the cleaners spent cleaning the property. If the estate is within the congestion zone and ULEZ, then you are also required to meet the charges. However, there is the possibility to avoid this expense, by booking our services during the weekend or during a bank holiday, when the congestion fee in London does not apply. A: Yes, we do, as it is part of our service. 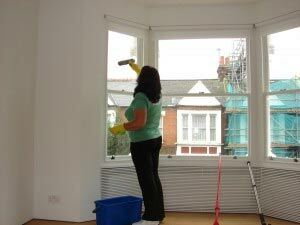 However, cleaning of windows exterior is not included at the end of tenancy cleaning quote. If you need to add exterior window cleaning to the service, it will be added as a separate quote. Nevertheless, if you want to have your windows cleaned from the outside as well, we will provide you with a discount for booking our combined services when moving out. A: We do require a 35% deposit, but it will be deducted from the final price. In some cases, we might ask for our client’s card information, but we do this only to secure the appointment on our schedule. In most cases, 65% of payment is settled upon completion of the service and after the final inspection of the rental before relocating. A: Our end of tenancy cleaners come fully equipped with machines and cleaning products needed for the completion of each cleaning task. A: The move-out cleaning service can require between 1 and 6 professional cleaners. The number depends on the size of your property. We will send as many cleaners as needed for the timely completion of the appointed service. A: All carpets, as well as the upholstery of your home, will be vacuumed. If you want them to be hot water extraction washed, you can request our carpet cleaning or upholstery cleaning service. We will give you a special discounted price for our combined services when you make the booking. Q: How much does it cost to have carpets steam cleaned? 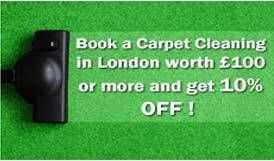 A: Best Cleaning London regularly performs hot water extraction cleaning for rugs and carpets in your property. You can add a professional end of tenancy carpet cleaning to your booking at a reduced price or book the service alone. You can check the prices for carpet cleaning here. A: Yes, we do. Professional oven cleaning is always a part of our move-out cleaning service. The appliance will be disassembled, and the racks and other removable parts will be soaked in a container filled with a professional-grade cleaning solution that quickly dissolves the grease and food residues. The oven will be scrubbed and polished both inside and outside. A: Yes, we can. Our end of tenancy cleaners regularly work while customers are away, but they will have to arrange a key pick-up with our team. Also, it is possible to pay for our services with a card or online. A: The end of tenancy cleaning service is charged at a fixed price, which means that the team will remain on site until the property is thoroughly cleaned. The number of hours required does not matter. A: While it is not usual for our cleaners to not properly clean something if they do, then you only need to call us within 48 hours, and we will appoint a second visit of the team. A: All of our professionals are vetted and fully covered, so you will get fair compensation if anything like this happens. Still, you can be sure that all our cleaners are professionally careful, so our customers do n’t have to worry about it at all. A: In most cases, moving furniture is not necessary. However, we might ask you to do it, in case the rental has too many furnishings. To make sure that you will get your deposit money back, the end of tenancy cleaners will have to vacuum and wipe beneath heavy furniture like sofas, wardrobes, cupboards, etc. A: Yes, our cleaners will wipe or vacuum the blinds as part of our end of tenancy cleaning service. A: Yes, we do, but only if these items are easy to reach.We clean cobwebs from the corners or ceilings. We at BCL work only with experienced and trained professional cleaners. Our vetting process ensures we employ only cleaners who could be traced back and know how to clean your home. BCL uses only top of the range equipment and environmentally safe cleaning materials. Our 16 years experience helps us to achieve a high-quality service, with little efforts, so the end results are amazing for most people. You can trust us with this important for every tenant task! We provide affordable end of tenancy cleaning service for all London postcodes and areas. What’s more, our end of tenancy cleaners is among the best and most experienced you can book. You can rely on our experience and commitment to providing you with a comprehensive cleaning service from top to bottom. We use professional equipment and detergents to ensure that only super clean and bright properties are returned to our customers at the end. Thus we guarantee that you get your deposit back after the checkout. Do you need a professional end of tenancy cleaning service in London? Call us today on 0800 9 247329. We work 24/7 to help busy people like you to get their deposit back. Our friendly call handlers will help you with a quote or will provide you with more information about our services. For the best end of tenancy cleaning don’t hesitate to contact us today! Most important of all nowadays is that our End of Tenancy Cleaning & after builder Services London prices are affordable and can fit everyone’s budget – for detailed information, please, check out our Prices Page and see for yourself if you don’t believe. Call us for more information or to book, complete the small quote/booking form, book a Free Call Back or contact us on 0800 9247 329.